The clinical presentation of patients with CAVMs depends in large part on pathology and location of the lesion. Venous malformations are most commonly found incidentally. Rarely, a cerebellar venous malformation may cause intracranial hemorrhage. Capillary telangiec-tasias are usually found at autopsy. Cavernous malformations often present with seizures and, less frequently, with hemorrhage. AVMs are the most common vascular malformation to become symptomatic. Most AVMs become symptomatic between 20 and 50 years of age. Less frequently, AVMs first become symptomatic during childhood or in adults greater than 60 years of age. Common presenting features include: hemorrhage (50%), seizures (25%), headache (12%) or progressive neurological deficit (12%) [5,24,25]. 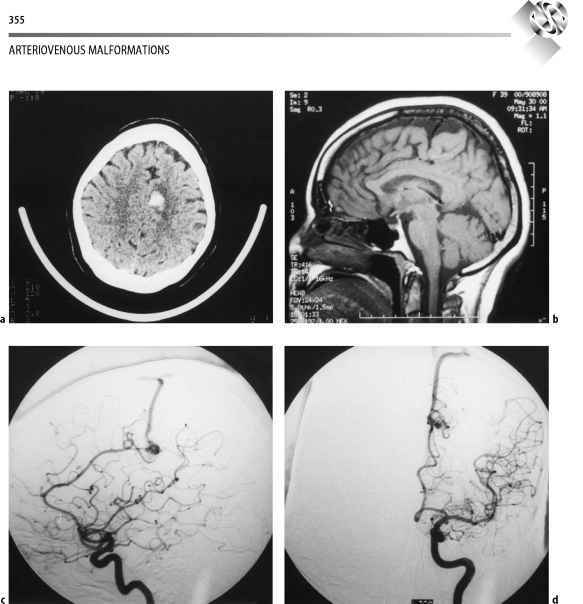 The clinical presentation may be predicted by the anatomic location of the AVM [6,24,25]. For example, AVMs located in the basal ganglia, corpus cal-losum, brain stem and cerebellum present with hemorrhage in greater than 70% of patients. In contrast, AVMs involving the medial temporal lobe and hippocampus generally present with seizures. Furthermore, parietal and occipital lobe AVMs and AVMs with external carotid artery feeders frequently present with headaches in the absence of cerebral hemorrhage. Fig. 20.1. Case 1: A 37-year-old woman presented with a generalized seizure. a A T2-weighted coronal MRI was obtained through the posterior cerebral cortex and cerebellar hemispheres. A cluster of flow voids characteristic of an AVM nidus and its draining veins was located in the left parietal-occipital lobe. b An axial T2-weighted MRI through the cerebral convexity demonstrated a cluster of large, dilated draining veins in the left posterior parietal lobe. c A left parasagittal Tl-weighted MRI with contrast administration showed a classic wedge-shaped nidus with the apex pointing towards the lateral ventricle. There was patchy contrast enhancement within the nidus. The nidus was approximately 3-4 cm in diameter. Catheter angiography was performed for treatment planning. d A lateral, mid-arterial phase right vertebral artery cerebral angiogram revealed the dysplastic nidal vessels being fed by branches of the left parieto-occipital artery. Early venous opacification was noted superficial to the AVM. Fig. 20.1. (continued) eAn anterior-posterior (AP) mid-arterial phase right vertebral artery cerebral angiogram displayed the patchy AVM nidus fed by the left parieto-occipital artery and its branches. f The lateral left internal carotid mid-arterial phase cerebral angiogram revealed additional feeding vessels from the middle cerebral artery, most notably large angular and posterior parietal branches. 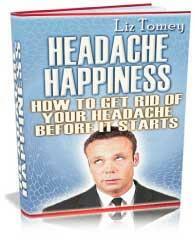 Many of the feeders appeared to be en passant, possibly feeding normal cerebral cortex. g An AP left internal carotid artery mid-arterial phase cerebral angiogram defined the arterial feeders from the middle cerebral artery. There was no deep venous drainage or deep arterial feeders present. This AVM was classified as a Spetzler-Martin Grade 3 (2 for size, 1 for eloquence (optic radiations) and 0 for deep venous drainage). This patient received preoperative NBCA embolization, followed by microsurgical excision. Fig. 20.2. Case 2: A 39-year-old female presented with sudden right-sided hemiparesis and headache. a An axial non-contrast CT scan revealed an acute intracerebral hemorrhage in the left medial centrum semiovale. 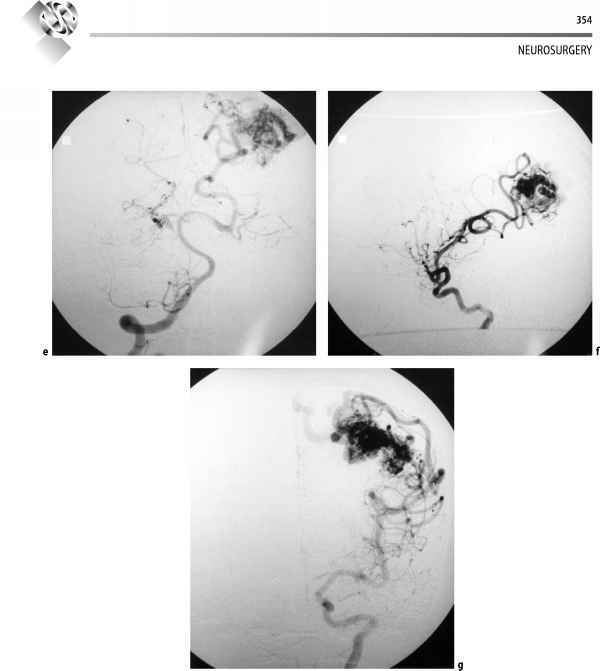 A cerebral angiogram revealed a left-sided 1-cm paracentral lobule AVM. The patient had significant recovery of her hemiparesis from intensive rehabilitation. 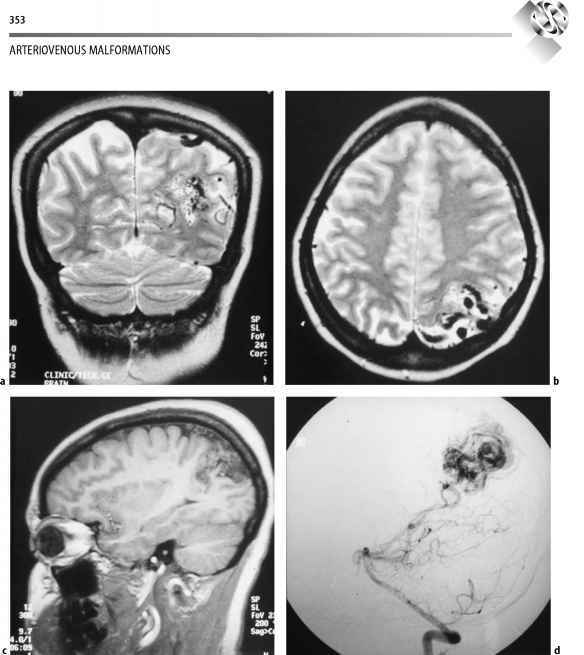 A MRI and repeat cerebral angiogram was performed 4 weeks after her ictus for treatment planning. b A mid-sagittal Tl-weighted non-contrast MRI displayed evidence of the AVM. Although small, a collection of vessels was noted at the distal callosomarginal artery territory in the cingulate sulcus anterior-inferior to the paracentral lobule. A prominent linear draining vein was noted in the paracentral sulcus subsequently entering the superior sagittal sinus. The paracentral lobule was markedly atrophic, presumably from her previous hemorrhage. c A lateral left internal carotid mid-arterial phase cerebral angiogram revealed a 1-cm AVM, being fed by the callosomarginal artery. Perpendicular to the feeding artery, early opacification of the malformation's draining vein was noted. d An AP left internal carotid mid-arterial phase cerebral angiogram further defined the midline AVM. There were no aneurysms or deep venous drainage present. This AVM was classified as a Spetzler-Martin Grade 2 (1 for size, 1 for eloquence (motor cortex) and 0 for deep venous drainage). This patient opted for surgical removal. Frameless stereotaxis was used during the operative procedure to define the nidal margins.